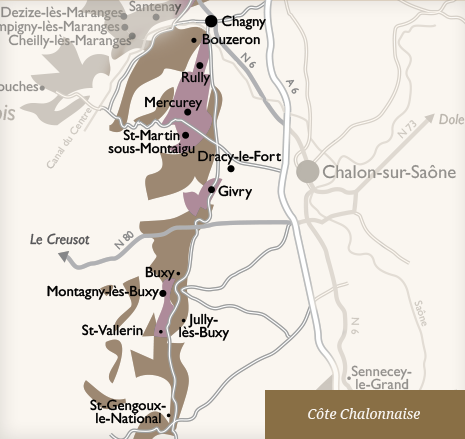 Located at the heart of the Côte Chalonnaise, the vineyards cover the slopes of 4 villages, including Montagny-lès-Buxy. This 301-ha appellation is entirely devoted to the cultivation of Chardonnay. Soil Located at an altitude of approximately 300 m, the vines are planted in calcareous clay soil interspersed with marl. The slopes are relatively steep and face south and southeast. Vinification Traditional vinification in tanks with temperatures maintained at 20°C. Aged on the lees in barrels (35 to 40% new oak) with stirring for 14 to 16 months to lend complexity to the wine. Robe Lovely light yellow with straw-coloured highlights. Nose The first nose is vegetal with nuances of moss and white mushrooms, paving the way for a hint of oak, which is balanced and discrete. Palate Soft tannins open up to notes of white blossoms. Serve with This Premier Cru’s freshness and minerality make it an ideal wine to enjoy as an aperitif with smoked salmon canapés or puff pastry filled with goat’s cheese and honey. At the table, it showcases fine fish such as grilled gilt-head bream or sole meunière as well as poultry such as guinea fowl with chorizo or ginger-scented chicken in coconut milk. Serve at Serve between 12 and 14°C in order to best appreciate this wine’s freshness and minerality.